Robert Wald reviews the 2010 book Many Worlds? : Everett, Quantum Theory, and Reality, based on meetings at Oxford and at the Perimeter Institute, commemorating the 50th anniversary of Everett's paper. A central issue in the Everett interpretation is the status of the `Born rule', which asserts that, for state ψ, the probability of obtaining a particular outcome of a measurement is ||Pψ||2, where P is the projection operator onto the eigensubspace associated with the measurement outcome. In traditional interpretations, the Born rule is simply postulated as part of the collapse hypothesis. In the Everett interpretation, it is far from obvious that the Born rule even has any meaning—if all outcomes occur, how can one talk about the probability of a particular outcome? Given the importance of this issue, it is highly appropriate that four chapters of the book (by Saunders, Papineau, Wallace, and Greaves and Myrvold) are devoted to addressing probability and the Born rule from the Everett viewpoint, and three chapters (by Kent, Albert, and Price) are devoted to criticising these views. See here for my thoughts on this. The origin of the Everettian heresy (see also Byrne's excellent biography of Everett). ... These efforts gave rise to a lively debate with the Copenhagen group, the existence and content of which have been only recently disclosed by the discovery of unpublished documents. The analysis of such documents opens a window on the conceptual background of Everett’s proposal, and illuminates at the same time some crucial aspects of the Copenhagen view of the measurement problem. Also, it provides an original insight into the interplay between philosophical and social factors which underlay the postwar controversies on the interpretation of quantum mechanics. (1a) Objective vs Subjective probability, short manuscript (ﬁrst half of 1955). (1b) Quantitative Measure of Correlation, short manuscript (summer 1955). (1c) Probability in Wave Mechanics, short manuscript (summer 1955). (2) Wave Mechanics Without Probability, second version of the dissertation (the long thesis) (winter 1955–1956), published as The Theory of the Universal Wave Function (1973). (3) On the Foundations of Quantum Mechanics, ﬁnal dissertation (winter 1956–1957), published as ‘‘Relative State’’ Formulation of Quantum Mechanics (July 1957). A Commentary on ‘Common SNPs Explain a Large Proportion of the Heritability for Human Height’ by Yang et al. (2010). (Ungated pdf.) Why do Visscher and company have to speak so slowly and enunciate so carefully in order to be understood? Well before reading the Yang et al. paper, but after hearing much about "missing" heritability, I asked impatiently why GWAS researchers had not tried to make a global fit of total heritability, as opposed to searching for individual alleles. See also Heritability 2.0. Turkheimer on heritability: Still Missing. Megan McCardle on her 10 year reunion at Chicago's Booth School of Business. The Atlantic: ... For my summer 2000 internship at Merrill Lynch, I chose the technology-banking group despite having watched the March 2000 NASDAQ crash from the lobby of Merrill’s auditorium, where we were supposed to be undergoing orientation. Ignoring the helpless, angry flapping of the HR staff, a bunch of us spent the afternoon telling nervous jokes and watching the eerie flicker that billions of dollars give off when they evaporate on live TV. Predictably, the technology-banking group had almost no work. Also, I was not a good fit with Merrill’s very conservative, very competitive culture. I felt as if I’d decided to intern with a mathematically gifted baboon tribe, and I’m sure they were just as puzzled by me. Unsurprisingly, I didn’t get a full-time offer. Having learned my lesson, I very sensibly turned around and took a full-time job upon graduation at … a technology-strategy consultancy. I got laid off even before the bankers. And they were laid off in droves, along with the consultants and aspiring dot-com employees; during my first year or two in New York, my recollection is that at least half my classmates there lost their jobs. Ten years later, only a few of the people I spoke with were still where they’d started out. How could we have failed to notice the danger? You know how: It’s the same reason your cousin bought that 16-room McMansion on an option ARM. Everyone else had been doing it for years, with seemingly stellar results. Why wouldn’t we follow in such successful footsteps? ... Indeed, if Booth is any indication, the complaint that “the best and the brightest” are being siphoned off into consulting and finance is less true today. ... Morton told me that current classes don’t talk as much as mine did about money; they talk about the things they want to make and do. Of course, these days, there’s also less money to distract them. Financiers are still rich—in 2010, the industry accounted for 5.3 percent of New York’s private-sector jobs, but 23.5 percent of its private-sector wages. But despite all the news about their huge bonuses, they aren’t as rich or as numerous as they used to be. By the end of 2012, New York’s Office of the State Comptroller expects the post-crisis job losses on Wall Street to top 30,000. Finance-related activities used to account for about 20 percent of state tax revenues; they now account for about 13 percent. However, those of us who left finance can take heart, because we are a lot closer to the top 1 percent than we used to be. In 2007, the entry point was $410,096. The top 1 percent’s share of national income has also dropped recently, as the finance professor Steven Kaplan pointed out when I ran into him. In fact, for all the fanfare greeting recent studies by the Congressional Budget Office on rising income inequality from 1979 to 2007, according to Kaplan’s calculations, between 2007 and 2009 the share of adjusted gross income that went to the top 1 percent dropped from 23.5 percent to 17.6 percent—the largest two-year drop since 1928–30. A few years back, Kaplan and the economist Joshua Rauh compared the incomes of Wall Street executives, “Main Street” executives, and celebrities such as professional athletes. They found that much of the rise in income inequality between 1994 and 2004 was due to the jump in Wall Street incomes: those of investment bankers, venture capitalists, hedge-fund managers, and top securities lawyers—the incomes that so many in my class were chasing. My classmates and I might not all have 1 percent–level incomes, but almost everyone seemed to have what Occupy Wall Street says it wants: stable, interesting, well-paying jobs … and a clear future. The few people who are still in finance are the ones who really like it, and are presumably really good at it. And the rest of us are probably better off than if we’d bartered away every waking moment of our 30s. The most remarkable thing about my business-school reunion was, in fact, how little people talked about money or jobs. They talked about family, friends, the trips they took, and the houses they were turning into homes. According to the behavioral economist Daniel Kahneman, they were talking about what is really important: “It is only a slight exaggeration to say that happiness is the experience of spending time with people you love and who love you.” Now, that’s a universe worth mastering. I found this econtalk podcast very interesting. The comments are also good. We Americans are very lucky to have inherited a high trust society from our forebears. How much longer will it last? Econtalk: David Rose of the University of Missouri, St. Louis and the author of The Moral Foundation of Economic Behavior talks with EconTalk host Russ Roberts about the book and the role morality plays in prosperity. Rose argues that morality plays a crucial role in prosperity and economic development. Knowing that the people you trade with have a principled aversion to exploiting opportunities for cheating in dealing with others allows economic actors to trust one another. That in turn allows for the widespread specialization and interaction through markets with strangers that creates prosperity. In this conversation, Rose explores the nature of the principles that work best to engender trust. The conversation closes with a discussion of the current trend in morality in America and the implications for trust and prosperity. See also this Wired article: The Neurobiology of Integrity. Whether sacred principles offer utilitarian benefits over long periods of time — many years, perhaps many generations, and at population-wide as well as individual scales — is beyond the current study design, but Berns suspects that one of their benefits is simplicity. Gracie Breakdown of UFC 142, leading off with the Rousimar Palhares heel hook finish. Back in the day when grappling and BJJ were still fringe activities, I often had to travel to strange clubs to find training. It was intimidating to visit a new school where I didn't know anyone, even more so to spar with people who could easily injure me. The one submission I was most afraid of was the heel hook. The two serious injuries I sustained in years of training were from a straight armbar (juji gatame) and a heel hook, which sprained the tendons around my knee. The heel hook is much more effective on the street, where the opponent is likely to be wearing shoes and pants (escaping by pulling the leg out is much harder than in MMA), although there are also reasons not to pull guard in a street fight. Here's a Palhares highlight video. Beautiful jiujitsu and very dangerous leglocks. I previously recommended the podcast New Books in History, hosted by University of Iowa historian Marshall Poe. I noticed recently that the format has been adopted by professor podcasters in other fields, including Sociology, Philosophy, Policy Studies, Military History, etc. For example, here are the podcasts from New Books in East Asian Studies. I found the interview with Michael Keevak on his recent book (below) quite interesting. It is amusing that Native Americans are "red", whereas E. Asians are "yellow". Keevak notes that European travelers to Asia before the 18th century never used this characterization. The earliest reference Keevak can find where the terminology is used is in a classification of races of man by Carl Linnaeus. See earlier post Yellow Peril: 2010 and 1920. In their earliest encounters with Asia, Europeans almost uniformly characterized the people of China and Japan as white. This was a means of describing their wealth and sophistication, their willingness to trade with the West, and their presumed capacity to become Christianized. But by the end of the seventeenth century the category of whiteness was reserved for Europeans only. When and how did Asians become "yellow" in the Western imagination? Looking at the history of racial thinking, Becoming Yellow explores the notion of yellowness and shows that this label originated not in early travel texts or objective descriptions, but in the eighteenth- and nineteenth-century scientific discourses on race. From the walls of an ancient Egyptian tomb, which depicted people of varying skin tones including yellow, to the phrase "yellow peril" at the beginning of the twentieth century in Europe and America, Michael Keevak follows the development of perceptions about race and human difference. He indicates that the conceptual relationship between East Asians and yellow skin did not begin in Chinese culture or Western readings of East Asian cultural symbols, but in anthropological and medical records that described variations in skin color. Eighteenth-century taxonomers such as Carl Linnaeus, as well as Victorian scientists and early anthropologists, assigned colors to all racial groups, and once East Asians were lumped with members of the Mongolian race, they began to be considered yellow. Demonstrating how a racial distinction took root in Europe and traveled internationally, Becoming Yellow weaves together multiple narratives to tell the complex history of a problematic term. Michael Keevak is a professor in the Department of Foreign Languages at National Taiwan University. From internet sensation to SNL last night. Call me crazy, but Video Games is a great song and could become part of the indie pop canon -- check out all the covers on YouTube that have appeared just in the last few months. One critic writes: ... the music video "flits between surrendering to romance and depression, moving with the elegant wastefulness of the kind of day drunk that's a true privilege of the beautiful, idle class." This very interesting study had access to comprehensive data ranging from Duke admissions office evaluations of applicants, to students' intended majors and subsequent shifts, to grades awarded and student composition (including abilities!) for each course offered at Duke. Interesting factoid: 40% of fathers of White students at Duke have doctorates. For similar studies (although not emphasizing ethnicity) using U Oregon data, see Data mining the University , Psychometric thresholds for physics and mathematics. If affirmative action results in minority students at elite schools having much potential but weak preparation, then we may expect minority students to start off behind their majority counterparts and then catch up over time. Indeed, at the private university we analyze, the gap between white and black grade point averages falls by half between the students' freshmen and senior year. However, this convergence masks two effects. First, the variance of grades given falls across time. Hence, shrinkage in the level of the gap may not imply shrinkage in the class rank gap. Second, grading standards differ across courses in different majors. We show that controlling for these two features virtually eliminates any convergence of black/white grades. In fact, black/white gpa convergence is symptomatic of dramatic shifts by blacks from initial interest in the natural sciences, engineering, and economics to majors in the humanities and social sciences. We show that natural science, engineering, and economics courses are more difficult, associated with higher study times, and have harsher grading standards; all of which translate into students with weaker academic backgrounds being less likely to choose these majors. Indeed, we show that accounting for academic background can fully account for differences in switching behaviors across blacks and whites. For a review of Richard Sander's analysis of affirmative action in law school admissions, see here. The results of all of these studies can be summarized as: to first approximation, psychometric predictors work, and in an unbiased way across ethnicities. Excellent colloquium by James Crow (who passed away recently) emphasizing the importance and ubiquity of additive genetic variance. See earlier post -- the paper linked there covers similar material. @28 min, Nagylaki came to population genetics after doing his PhD under Feynman at Caltech! Here is his tour de force result, mentioned by Crow in the talk. Interested physicists, see also here. Human genetics has been haunted by the mystery of “missing heritability” of common traits. Although studies have discovered >1,200 variants associated with common diseases and traits, these variants typically appear to explain only a minority of the heritability. The proportion of heritability explained by a set of variants is the ratio of (i) the heritability due to these variants (numerator), estimated directly from their observed effects, to (ii) the total heritability (denominator), inferred indirectly from population data. The prevailing view has been that the explanation for missing heritability lies in the numerator—that is, in as-yet undiscovered variants. While many variants surely remain to be found, we show here that a substantial portion of missing heritability could arise from overestimation of the denominator, creating “phantom heritability.” Specifically, (i) estimates of total heritability implicitly assume the trait involves no genetic interactions (epistasis) among loci; (ii) this assumption is not justified, because models with interactions are also consistent with observable data; and (iii) under such models, the total heritability may be much smaller and thus the proportion of heritability explained much larger. For example, 80% of the currently missing heritability for Crohn's disease could be due to genetic interactions, if the disease involves interaction among three pathways. In short, missing heritability need not directly correspond to missing variants, because current estimates of total heritability may be significantly inflated by genetic interactions. Finally, we describe a method for estimating heritability from isolated populations that is not inflated by genetic interactions. This new paper by Eric Lander and collaborators is attracting a fair amount of interest: gnxp , genetic inference , genomes unzipped. The paper is discussed at some length at the links above. I will just make a few comments. 1. The non-additive models analyzed in the paper require significant shared environment correlations to mask non-additivity and be consistent with data that (at face value) support additivity. See Table 7 in the Supplement. This level of environmental effect is, in the cases of height and g, probably excluded by adoption studies, although it may still be allowed for many disease traits. To put this another way, even after reading this paper I do not know of any models consistent with what is known about height and g that do not have a large additive component (e.g., of order 50 percent of total variance). The problem with this reasoning is: As the population grows (and the typical locus tends toward monomorphism), typical traits involving typical loci become very boring! They not only have low interaction variance VAA, they also have very low total genetic variance VG. That is, the typical trait doesn't vary much in the population! In effect, Hill et al. 's theory thus actually describes what happens for rare traits caused by a few rare variants. Not surprisingly, interactions account for a small proportion of the variance for such traits. "Doesn't vary very much" is not well-defined: relative to what? What if the genetic variance in this limit is still much larger than the environmental component? Do height and IQ "vary very much" in human populations? Having only moderately rare variants (e.g., MAF = .1-.2), but many of them, is consistent with normally distributed population variation and small non-additive effects (.2 squared is 4 percent). Below is figure 9 from the Supplement -- click for larger version. 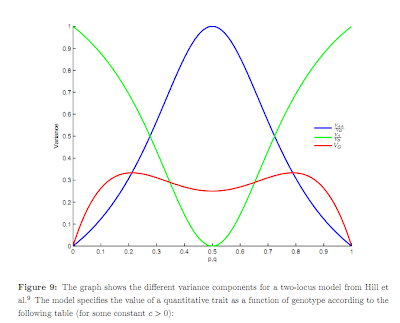 As the frequency p approaches zero (or unity) the additive variance (green curve) dominates and the non-additive part becomes small (blue curve). Whether the total genetic variance (red curve) is big or small might be defined relative to the size of environmental effects, which are not shown. Note the green and blue curves are dimensionless ratios of variances, whereas the red curve ultimately (after multiplication by effect size) has real units like cm of height or IQ points. The essence of Hill et al. is discussed in the earlier post (see comments). Yes, one of the main points of the paper I cited is that one can have strong epistasis at the level of individual genes, but if variants are rare, the effect in a population will be linear. Note Added: For more on additivity vs epistasis, I suggest this talk by James Crow. Among other things he makes an evolutionary argument for why we should expect to find lots of additive variation at the population or individual level, despite the presence of lots of epistasis at the gene level. It is much more difficult for evolution to act on non-additive variance than on additive variance in a sexually reproducing species. The NYTimes ran a nice profile of Broad Institute director Eric Lander a few days ago. NYTimes: ... He was so good that he was chosen for the American team in the 1974 Mathematics Olympiad. To prepare, the team spent a summer training at Rutgers University in New Brunswick, N.J.
Dr. Zeitz was Dr. Lander’s roommate that summer. The two recall being the only team members who did not come from affluent suburban families, and the only ones who did not have fathers. But Eric stood out for other reasons. “He was outgoing,” Dr. Zeitz recalled. “He was, compared to the rest of us, definitely more ambitious. He was enthusiastic about everything. And he had a real charisma.” Team members decided that Dr. Lander was the only one among them whom they could imagine becoming a United States senator one day. At first, though, it looked as if the young mathematician would follow a traditional academic path. He went to Princeton, majoring in mathematics but also indulging a passion for writing. He took a course in narrative nonfiction with the author John McPhee and wrote for the campus newspaper. He graduated as valedictorian at age 20, won a Rhodes scholarship, went to Oxford and earned a mathematics Ph.D. there in record time — two years. Yet he was unsettled by the idea of spending the rest of his life as a mathematician. “I began to appreciate that the career of mathematics is rather monastic,” Dr. Lander said. “Even though mathematics was beautiful and I loved it, I wasn’t a very good monk.” He craved a more social environment, more interactions. “I found an old professor of mine and said, ‘What can I do that makes some use of my talents?’ ” He ended up at Harvard Business School, teaching managerial economics. He had never studied the subject, he confesses, but taught himself as he went along. “I learned it faster than the students did,” Dr. Lander said. His appetite for biology whetted, he began hanging around a fruit-fly genetics lab at Harvard. A few years later, he talked the business school into giving him a leave of absence. A colleague recommended this beautifully written Quora answer concerning the nature of mathematical thinking. I recommend reading it in its entirety. The particularly "abstract" or "technical" parts of many other subjects seem quite accessible because they boil down to maths you already know. You generally feel confident about your ability to learn most quantitative ideas and techniques. A theoretical physicist friend likes to say, only partly in jest, that there should be books titled "______ for Mathematicians", where _____ is something generally believed to be difficult (quantum chemistry, general relativity, securities pricing, formal epistemology). Those books would be short and pithy, because many key concepts in those subjects are ones that mathematicians are well equipped to understand. Often, those parts can be explained more briefly and elegantly than they usually are if the explanation can assume a knowledge of maths and a facility with abstraction. Learning the domain-specific elements of a different field can still be hard -- for instance, physical intuition and economic intuition seem to rely on tricks of the brain that are not learned through mathematical training alone. But the quantitative and logical techniques you sharpen as a mathematician allow you to take many shortcuts that make learning other fields easier, as long as you are willing to be humble and modify those mathematical habits that are not useful in the new field. This recent paper gives a sense of the current state of the art in quantitative genetics. Height is one of the easiest phenotypes to measure, so almost every medical (disease) GWAS provides some additional data -- IIRC, about 200k pheno/geno-type pairs are available for analysis. With a few hundred associated variants detected (depending on how one defines the discovery threshold), one can start to construct predictors like the Weighted Allele Score (WAS) shown below (which is essentially the breeding value from population genetics). See related posts here, here and here. It is interesting to think about what a similar figure would look like once loci accounting for 50% or 80% of total variance have been identified. (The current value is about 10%.) I would guess this will happen within 5-10 years (approx. 10^7 individuals of known height genotyped). Abstract: Common genetic variants have been shown to explain a fraction of the inherited variation for many common diseases and quantitative traits, including height, a classic polygenic trait. The extent to which common variation determines the phenotype of highly heritable traits such as height is uncertain, as is the extent to which common variation is relevant to individuals with more extreme phenotypes. To address these questions, we studied 1,214 individuals from the top and bottom extremes of the height distribution (tallest and shortest ,1.5%), drawn from ,78,000 individuals from the HUNT and FINRISK cohorts. We found that common variants still influence height at the extremes of the distribution: common variants (49/141) were nominally associated with height in the expected direction more often than is expected by chance (p,5610228), and the odds ratios in the extreme samples were consistent with the effects estimated previously in population-based data. 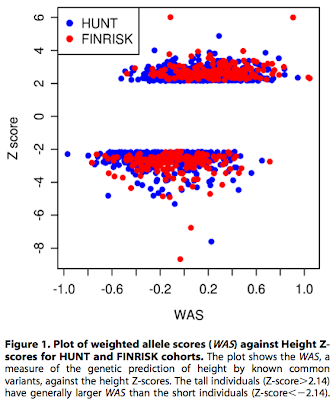 To examine more closely whether the common variants have the expected effects, we calculated a weighted allele score (WAS), which is a weighted prediction of height for each individual based on the previously estimated effect sizes of the common variants in the overall population. The average WAS is consistent with expectation in the tall individuals, but was not as extreme as expected in the shortest individuals (p,0.006), indicating that some of the short stature is explained by factors other than common genetic variation. The discrepancy was more pronounced (p,1026) in the most extreme individuals (height,0.25 percentile). The results at the extreme short tails are consistent with a large number of models incorporating either rare genetic non-additive or rare non-genetic factors that decrease height. We conclude that common genetic variants are associated with height at the extremes as well as across the population, but that additional factors become more prominent at the shorter extreme.